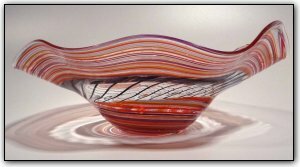 This incalmo bowl was made with hand pulled canes of purples, reds, black, and gold. Working with canes is a two stage time consuming process, first Dirwood hand pulled the canes used to make this bowl then he made the bowl using those canes. In addition to the hand pulled canes, this incalmo bowl was made from 3 separate sections. Incalmo is an extremely complex technique where each section is made separately and then they are joined one at a time while the glass is still hot. Each section was formed as its own separate molten bubble, then they were fused together and blown out as one unified bubble using the incalmo method. Some of the canes are "bubble" canes which creates thousands of super tiny bubbles, so make sure to zoom in to see the level of intricate level of detail. This is a truly breathtaking one-of-a-kind piece of art!